Solar photovoltaic panels are usually installed on roof spaces. This ensures that there is less chance of the panels being in the shade and getting the full benefit of the sun. Placing them on the roof also means that they are out of the way. If you do not have a suitable roof you can install them in your garden where an 'A' frame can be used to angle the panels in a south facing direction. A common question is how much space you will need on your roof for these solar panels. There are various makes and model of PV panel that come in different sizes and generate different amounts of electricity. 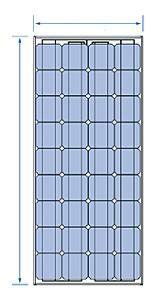 Some panels can generate more power per square metre than others. If space is at a premium it may be worth investing in the most efficient model available. As well as energy per square metre you should also consider the cost per watt or installed cost per watt. This is a good measure of value to determine which system us the best value for money. It is important to note that you will never usually get the maximum efficiency from your panels so a good rule of thumb is that you will get about 850watts for every kilowatt of photovoltaics that you install. I have put together some figures to illustrate the size of installed system you may be able to fit on your roof. The figures are based on one of the best selling solar panels, this rectangular shaped panel covers an area of approximately 1.3 metres squared. The data below shows the size of the system measured in kilowatt hours (kWh), the number of panels in that installation and the area needed on your roof in metres and good old fashioned square feet. The size of the array you decide to get installed is going to be dependant on several factors. The maximum size is going to be dictated by the area of your south facing roof space. You could get panels installed on a more easterly or westerly facing roof in addition to the south facing area but you will need a slightly different setup in order for it to work efficiently. The next limiting factor is going to be cost. If you do not have the money to get a larger system or cannot or do not want to borrow the money then the size of the array is going to be limited by the solar panel cost. It is important to remember however that the more kilowatt hours of electricity you produce the more you will earn from the governments feed in tariff that pays you for all the green electricity that you produce. If you are not in a position to pay for a system there are several companies that are willing to install solar panels for free including big companies such as British Gas. With a free system you will not get any tariff payments but you will get to use any of the free electricity the panels produce.